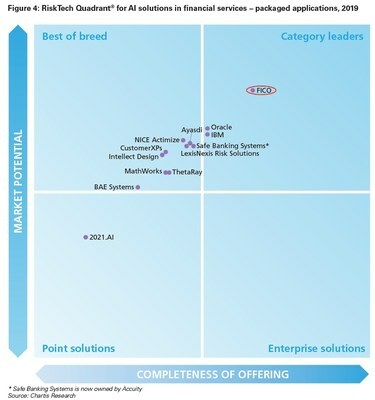 FICO, a leading analytics company, today announced that it has been named a category leader in the AI in Financial Services, 2019; Market and Vendor Landscape report from Chartis Research. FICO was named a category leader in both AI analytics and packaged AI applications. A supplementary report, Vendor Analysis: FICO; Artificial Intelligence in Financial Services, 2019, takes a more detailed look at FICO's rating and capabilities. The Vendor Analysis report noted that*: "While the use of AI is now prevalent across many industries and emerging use cases, FIs, in many ways, pioneered the use of AI in commercial applications. FICO was among the first to provide AI tools to FIs, and it has continued to invest in ML R&D focused on helping banks meet ever-more sophisticated customer requirements." "A lot of companies talk about AI without delivering — in fact, a recent report by MMC Ventures found that 40 percent of European AI start-ups didn't actually have any AI," said Stuart Wells, executive vice president and chief technology officer at FICO. "At FICO, we condense decades of banking experience into cloud-based machine learning applications that use the latest Big Data technologies. This Chartis report validates FICO's deep experience in AI solutions, which have been helping global banks prevent fraud and strengthen consumer loyalty since 1992. With 100+ patents related to machine learning and AI in our portfolio, we continue to lead the field for AI in financial services." "Real-time payments are rapidly gaining traction in the US, spurred partly by dramatic growth in the use of P2P services and mobile payments. FICO's ML capabilities play a role in protecting these digital interactions, which are especially susceptible to account takeover. FICO's AI techniques for real-time payments also apply to aspects of recent Payment Services Directive 2 (PSD2) and Open Banking requirements in the UK," the Vendor Analysis report continued. "FICO has also developed AI techniques in response to regulatory encouragement for innovation and efficiency in AML programs. Recently introduced models monitor transactions to detect anomalies, as well as transaction streams that indicate previous SAR filings by the institution." Last year, FICO was named a category leader in the Chartis report on Enterprise Fraud. FICO was also named a category winner in the 2019 Chartis' RiskTech100® report, where FICO won awards in three categories: Innovation, AI, and Cyber Risk Quantification. FICO and Falcon are registered trademarks of Fair Isaac Corporation in the United States and other countries. *Note that these statements and the RiskTech Quadrant® were published by Chartis Research as part of a larger research document ("Vendor Analysis: FICO; Artificial Intelligence in Financial Services, 2019") and should be evaluated in the context of the entire document. Chartis evaluates all vendors using consistent and objective criteria, and does not endorse any vendor, product or service depicted in its research publications, nor does it advise technology users to select only those vendors with the highest ratings or other designation. Chartis Research's publications consist of the opinions of its research analysts and should not be construed as statements of fact.